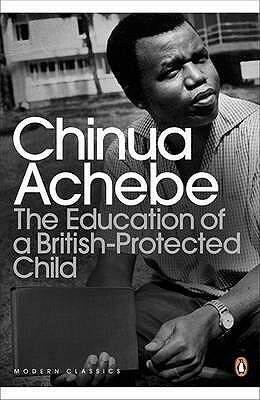 The Education of a British-Protected Child is a non-fiction, "autobiographical" collection of essays. Chinua Achebe's reflection on identity, literature, language and politics, home and family. Mostly, between 1988 and 1999. Firstly, Achebe stated his strong objection to colonialism. Of which, I also have a natural aversion to. How a gross crime it is to seize someone else's land and his history, dispose him of his culture and identity, deny him of his worth and dignity. And, at the same time disingenuously justify the act by saying that the victim is unfit, soulless and spiritless, not human enough, and requires protection. In point of fact, colonialism was brutal and perverse and armed with gun, their only aim was to indoctrinate the natives. They came disguised in Christianity. For this reason, a colonial educational program was established. Fortunately, most of the students refused to dwell on the harsh humiliations of colonial rule, refused to be defined by the adversity; instead they turned out to be the foundation of modern African literature. They were Chinua Achebe himself, Christopher Okigbo, Gabriel Okara, Elechi Amadi, Chukwuemeka Ike, I.N.C Aniebo, Ken Saro-Wiwa and etceteras. Next, Achebe's first encounter with racism in the east southern part of Africa while enjoying his Rockefeller Fellowship award. ....travelling as a Nigerian was exciting. People listened to us. Our money was worth more than the dollar. When the driver of a bus in the British colony of Northern Rhodesia in 1961 asked me what I was doing sitting in the front of the bus, I told him nonchalantly that I was going to Victoria Falls. In amazement he stooped lower and asked where I came from. I replied, even more casually, "Nigeria, if you must know; and by the way, in Nigeria we sit where we like in the bus". Likewise, the transatlantic slave trade, -mankind's greatest crime against humanity. It all began with the denigration of Africa and its people and developed with offensive and trashy writings that tarnished its name. Joseph Conrad is a an example of one of those writers that never considered Africans as human beings; instead they were dehumanized in his novel "Heart of Darkness". Of which; certainly, I have no intention of reading. The truth is that we chose English not because the British desired it but because, having tacitly accepted the new nationalities into which colonialism had forced us, we need its language to transact our business, including the business of overthrowing colonialism itself in the fullness of time...... For me, it is not either English or Igbo, it is both. Chinua Achebe Day, "in recognition of his commitment to his art as well as to the expression and transmission of knowledge and truth through his writing and teaching". Additionally, my love and admiration for Martin Luther King was enhanced, my inspirational person. What a young fellow he was when he passed away. Only thirty-nine! And we are not talking about a champion athlete or boxer who must achieve his peak early, but a thinker/activist who must grow, meditate on his mission, and mature into action. He achieved a lot himself and stood in a long line of a people's struggle for freedom and justice. Mahatma Gandhi at the age of thirty-nine had not even returned to India! we have not had the same past, you and ourselves, but we shall have strictly the same future. The era of separate destinies has run its course. We human beings have a fundamental obligation to respect life even in the thick of a just struggle, for if they should forget or suspend this obligation and violate the lives of others, they would cheapen their own lives and their very humanity.... The great Bantu dictum on humanity's indivisibility: Umuntu ngumuntu ngabantu, "A human is human because of other humans". We cannot trample upon the humanity of others without devaluating our own. I will have to re-read this book in the future because, I felt some topics were somewhat beyond my comprehension. Nonetheless, I had a clear understanding of many other interesting and insightful themes that were so well elaborated, to the extent I felt the great Achebe was speaking to me in person. It's a pity, I am unable to touch all issues in my brief review. In any case, I recommend that you buy the book and read for yourself. Finally, this novel was a gift to me; it was neither bought with much thought nor planning. We came across it in a book shop while touring San Sebastian, North of Spain. I love the picture of young Achebe on the cover. You can tell that it was taken somewhere in Nigeria. Deep indeed. Please read it. Thanks Kingsley, I am very pleased. Mary God bless you for giving our own Achebe what to be proud of in death. Much as I agreed with Achebe on the colonialists coming with guns, I am however surprised that neither him nor you the reviewer mentioned the gullibility of our then rulers to trade away human beings for a bottle of rum and a gun. We had heartless chiefs that enjoyed the dehumanising of the black brethren and history must castigate them along with the colonialists. Hi Binshehu, thanks for stoping by and compliments of the season! I am actually not an expert in the history of the transatlantic slave trade, my review of the book is based on its content. I understand your point of view, however in other not to fall in the traps of presentism I'd like to study that historical event in its context in order to give my opinion with respect to your comment.